In her den in a snow drift Mama Bear gives birth to two tiny cubs. Curious about their surroundings but a little nervous the two cubs ask their mother about the wider world. She tells them about the landscape, the ice, sea and its creatures and what will happen when they leave their cosy den. 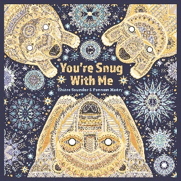 This story reads like a lullaby with the reassuring refrain ‘You’re snug with me.’ However it also has an important message, introducing the wildlife of the polar lands and suggesting their interdependency. It highlights our responsibility to look after our precious world only taking what we need, a message reiterated in the author’s letter to the reader at the end of the book. The illustrations are stunning with lots of detail to discover if you look closely. Intricately woven in silver, grey and gold they dazzle the reader revealing the beauty of the Polar Regions and its wildlife. Read the story aloud – do this slowly to allow time to really look closely at the images there is so much to spot. You might want to read the book quietly, perhaps even whisper the Mama Bear’s words to echo her soothing reassurances. As you read again children could join in with Mama Bear’s refrain ‘Hush now you’re snug with me.’ Or take the part of the cubs asking their questions. Share favourite images and favourite lines from the story. Talk about any puzzles your child may have eg about unfamiliar vocabulary such as ‘drift’ or ‘faltered’ or creatures they are not familiar with. Read the author’s note at the end of the book and talk together about what you know about the polar regions and what everyone can do to look after our world. Make a cosy den for the baby bears. Your child could place little toy bears or other soft animal toys in a shoe box full of ‘snow’ made from wadding, foam packaging or cotton wool to replicate the den Mama Bear made. If it happens to be snowy or icy weather you could go for a walk in the snow and have fun making footprints. If there is an ice rink nearby have a look at that to imagine a polar world. If no snow or ice is available outside your child can feel how hard and cold ice cubes are. See below for some ice experiments. Talk about what your child already knows and what they would like to find out. Make a list of questions eg ‘What do they eat?’ Or ‘How long do they live?’ Use the websites and YouTube videos in our find out more section to try and answer your child’s questions together. Make a zig zag book with a page for each fact about polar bear, things your child already knew and things they have found out. Encourage your child to illustrate the book too. Make some ice with your child how long does it take to freeze? Put an ice cube in a bowl and see how long it takes to melt – does this happen quicker if the ice is in a warmer place?